In summer, farmers’ markets are rich with tomatoes. 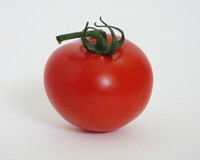 Tomatoes are rich in vitamin C and contain lycopene as well as small (almost negligible) amounts of nicotine. There are many health benefits of eating tomatoes. Tomatoes contain compounds that have been proven to help prevent cancer, heart disease cataracts and many others. While choosing/buying your tomatoes, be sure to pick those with the most brilliant shades of red. These indicate the highest amounts of betacarotene and lycopene.